There, Ricky is inducted into a band of paranormal investigators comprised of former addicts and petty criminals, all of whom have at some point in their wasted lives heard the Voice: a murmur on the wind, a disembodied shout, a whisper in an empty room. All these may or may not have been messages from God. Their mission is to find the Voice—and figure out what it wants. 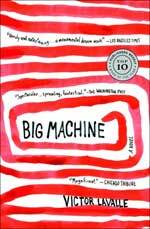 Big Machine takes us from Ricky's childhood in a matrilineal cult housed in a New York City tenement to his near-death experience in the basement of an Iowa house owned by a man named Murder. And to his final confrontation with an army of true believers—and with his own past. rattling mystery about doubt, faith, and the monsters we carry within us.